Life Coach Santa Fe Life Coach Santa Fe Soft Skills for Tough Issues, a book on leadership, emphasizing communication, life and career coaching and motivating performance in the workplace. Are you ready to move ahead to a position of leadership in the workplace? As a key decision-maker or future business leader in your organization, you will want to know about an exciting new interactive book authored by executive coach and workplace trainer Jean Eva Thumm. Be able to answer the question, "Why do performance appraisals?" As the work arena of our lives continues to demand more time and energy from each of us, the workplace has become “the family away from family.” According to Ms. Thumm, workplace families need to have strong and compassionate leadership -- leaders who can model exemplary behavior for employees and who can provide both the support and the discipline that their direct reports need in order to perform optimally. Soft Skills for Tough Issues helps you look squarely at workplace issues and provides the necessary guidance for you to communicate with and motivate those under your supervisory care. Jean Eva recently presented material from her book at the 40th Anniversary of WIC, held in Albuquerque, NM. She delivered an interactive lecture on "Personality Type in the Workplace." This material was well received, and many audience members purchased a copy of Soft Skills for Tough Issues.. Why don't you order your copy today! Soft Skills for Tough Issues is also available on Kindle. 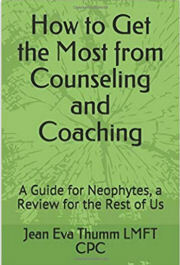 How to Get the Most from Counseling and Coaching: A Guide for Neophytes, a Review for the Rest of Us. All you need to know to select the right counselor for you; what you can expect from different counseling modalilties, for example, CBT; how to negotiate fee schedules; how to work with flexibility in your and your counselor's schedule; plus much more! We address the nuts and bolts of different healing strategies for anxiety, depression, post-traumatic stress, addiction, marital and family issues, plus goals and healing modalities for individuals. Chapter Four Counseling or Coaching? Jean Eva Thumm, LMFT, CPC, is a coach and counselor at Beyond the Horizons Consulting, LLC, in Seaford, Delaware. She loves her work and uses a uniquely tailored approach to every individual, couple of family entering her office. Her first book, Soft Skills for Tough Issues: Fostering Interpersonal Communication in the Workplace, is also available online. How to Get the Most from Counseling and Coaching is available on Kindle and Amazon.